While there's a natural tendency to want to 'think big' , 'do big' and 'be big' in life, relationships and business, much of the results we get are in doing the little things in a consistent way. Doing the little things makes a big difference, much bigger than we are willing to admit. Listen to the news and see how people are changing their world by doing seemingly little things. I read the profiles of most of the CNN Heroes of 2012, and one thing struck me - they were ordinary people, doing little things in their own ways, to change their worlds. I witnessed a fatality some weeks back, on a highway in Cairo. The car involved was almost brand new and all the safety gadgets needed to protect anyone must have been in place. However, the driver was not wearing his seat belt! As 'little' or trivial as that might sound, it was what made the difference between life and death. Did you hear about the bridge that collapsed in Japan recently? 9 people were killed and several injured. Initial reports shows that a missing bolt (yes, something as small as a missing bolt) was responsible for the collapse. Can you imagine that? Those little things sure can make a very big difference. I know and work with a lot of very successful leaders and aspiring leaders who set very ambitious improvement goals for themselves. They want to be more strategic, lead change, be more visionary, improve their presentation skills, learn marketing and finance, and improve their work-life balance. Yes, these are all important and impressive goals. They can be huge mountains to climb, and could even take years to achieve or master. However, approaching these goals little by little but consistently, would ultimately get them there. This reminds me of a parent that screamed at her teenager: "if you want to clean up the environment, why don't you start by cleaning your damn room". I came across this story a couple of years ago that further explains how little things, like acts of kindness and courtesy, can go a long way in making a huge difference. Many years ago, an elderly man and his wife entered the lobby of a small Philadelphia hotel. "All the big places are filled," the man said. "Can you give us a room?" The clerk replied that with three conventions in town, no accommodations were available anywhere. "Every guest room is taken," he said, but then added, "but I can't send a nice couple like you into the rain at one o'clock in the morning. Would you be willing to sleep in my room?" The next morning as he paid his bill, the elderly man said to the clerk, "You are the kind of manager who should be the boss of the best hotel in the United States. Maybe someday I'll build one for you." The clerk laughed and forgot about the incident. About 2 years later, however, he received a letter containing a round trip ticket to New York and a request that he be the guest of the elderly couple he had befriended. Once in New York, the old man led the clerk to the corner of Fifth Avenue and Thirty-Fourth Street, where he pointed to an incredible new building and declared "That is the hotel I just built for you to manage." The young man, George C. Boldt, accepted the offer of William Waldorf Astor to become the manager of the original Waldorf- Astoria, considered the finest hotel in the world in its time! May I encourage you not to neglect the little things, because you are focusing on the big things? May I encourage you to pay attention to the "little" things, even as you dream big? May I encourage you not to get carried away with the notion that if what we do is not big enough, it could make no difference? It is time for a paradigm shift - do not take for granted the 'little', do not overlook ' the little', and when all you get sometimes is 'little', do appreciate it. In actual sense, the 'Little' things do make a BIG difference. In just a few more weeks, or perhaps days, the year 2012 will come to an end. A couple of people are already taking stock of the year and wondering why they are behind on their dreams and on their plans. I bet you would have at least 1 thing on your list that you didn't succeed at. You are probably wondering why you failed at it, or what really happened. It becomes are bit more serious if it is an item you have been “carrying over” for a few years now. Do you feel a sense of failure…..yet again? You are not alone. 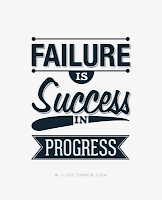 Most people who have become famous have invariably tasted failure early in their lives and careers, lending credence to a view that failure is the stepping-stone to success. Failure is a friend, not an enemy. Failure is a school teacher, not a taskmaster. See it as such and you will benefit immensely. I am always thrilled by the definition of success I saw somewhere a couple of years back. It says “Success is moving from one failure to another without losing enthusiasm!” Of a truth, the mistakes we make are not as important as the lessons we learn from them. Success is moving from one failure to another without losing enthusiasm. A number of years ago, an aspiring writer interviewed Thomas J. Watson, the President of IBM. Watson gave him this advice: “It’s not exactly my line, “he said, but would you like me to give you a formula for writing success? It’s quite simple, really. Double you rate of failure.” "You're making a common mistake," he said. "You're thinking of failure as the enemy of success. But it isn't at all. Failure is a teacher--a harsh one, perhaps, but the best. You say you have a desk full of rejected manuscripts? That's great! Every one of those manuscripts was rejected for a reason. Have you pulled them to pieces looking for that reason? That's what I have to do when an idea backfires or a sales program fails. You've got to put failure to work for you." He folded his napkin and put it beside his plate. "You can be discouraged by failure--or you can learn from it. So go ahead and make mistakes. Make all you can. Because, remember, that's where you'll find success. On the far side of failure. "What a profound truth this is! My point today is pretty simple (I hope) - don’t allow your failures or setbacks to discourage you. Failure needs not be fatal. When treated properly, failure can lead to great success and be a great learning experience. Henry Ford observed, "Failure is the opportunity to begin again more intelligently." Don't try to hide your mistakes, simply admit them, learn from them and grow from them. Remember that it's OK to fail! It is okay to make mistakes as long as you don’t make the same mistake twice. Failure is like a tuition you pay for you to succeed. A couple of years after Watson gave the above advice to the young aspiring writer, Arthur Godson, he went on to become a well known author and editor. He later said of Watson’s advice, “Somewhere inside me, a basic attitude had shifted. A project turned down, a lot of rejected manuscripts –why, these are nothing to be ashamed of. They were rungs in a ladder- that was all”. May I encourage you to do the same? You may be closer to success than you can ever imagine. Giving up now will just make all efforts of yesteryear go down the drain! One more push might be all you need. One more contact might be all that is required. One more trial might be the breakthrough you have been waiting for. Just one more…….. I guess I have shared the story of Sir Edmund Hillary before. Let me share it again to drive this point home. Sir Edmund Hillary was the first man to climb Mount Everest. On May 29, 1953 he scaled the highest mountain then known to man-29,000 feet straight up. He was knighted for his efforts. He even made American Express card commercials because of it! However, until we read his book, High Adventure, we don't understand that Hillary had to grow into this success. You see, earlier in 1952 he had attempted to climb Mount Everest, but failed. A few weeks later a group in England asked him to address its members. Hillary walked on stage to a thunderous applause. The audience was recognizing an attempt at greatness, but Edmund Hillary saw himself as a failure. He moved away from the microphone and walked to the edge of the platform. He made a fist and pointed at a picture of the mountain. He said in a loud voice, "Mount Everest, you beat me the first time, but I'll beat you the next time because you've grown all you are going to grow... but I'm still growing!" A year later, he succeeded where he has failed. Failure isn’t bad if it doesn’t attack the heart. Success is alright if it doesn’t get to the head! I have learnt something about successful people. They don’t avoid mistakes; they handle it. Peter Drucker once said "The better a man is, the more mistakes he will make, for the more new things he will try. I would never promote into a top level job a man who was not making mistakes…otherwise he is sure to be mediocre." Failure should be a teacher, not an undertaker. Failure isn’t bad if it doesn’t attack the heart. Success is alright if it doesn’t get to the head! Make the best of the rest of the year my dear friends, and double your failure rate and then success would be guaranteed. A couple of years ago, a colleague sent me an interesting piece. It changed the way I perceived things after that. Over time, I have seen this help me in different situations, especially difficult ones. It taught me, or would I say it reminded me of how to view problems and seeming impossibilities. I have shared this story before, and I perceive it is worth sharing again. Japanese grocery stores had a problem. They are much smaller than their US counterparts and therefore don't have room to waste. Watermelons, big and round, wasted a lot of space. Most people would simply tell the grocery stores that watermelons grow round and there is nothing that can be done about it. But some Japanese farmers took a different approach. "If the supermarkets want a space efficient watermelon,” they asked themselves, "How can we provide one?" 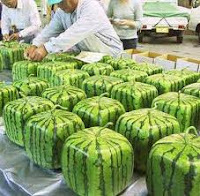 It wasn't long before they invented the square watermelon. Yes, they did! The solution to the problem of round watermelons wasn't nearly as difficult to solve, for those who didn't assume the problem was impossible to begin with and simply asked how it could be done. It turns out that all you need to do is place them into a square box when they are growing and the watermelon will take on the shape of the box! That simple? Yes, it was that simple! Impossibilities only exist in the dictionary of fools. This made the grocery stores happy and had the added benefit that it was much easier and cost effective to ship the watermelons. Consumers also loved them because they took less space in their refrigerators which are much smaller than those in the US - which resulted in the growers being able to charge a premium price for them. The major problem was that most people had always seen and used to round watermelons so they automatically assumed that square watermelons were impossible before even thinking about the question. Things that you have been doing a certain way your entire life have taken on the aura of the round watermelon and you are likely not to even take the time to consider if there is another way to do it. Breaking yourself from assuming this way can greatly improve your overall life as you are constantly looking for new and better ways to do things. The best way to tackle these assumptions is to question your habits. If you can make an effort to question the way you do things on a regular basis, you will find that you can continually improve the way that you live your life. Forming habits when they have been well thought out is usually a positive thing, but most of us have adopted our habits from various people and places without even thinking about them. When faced with a problem, be creative in looking for a solution. This often requires thinking outside the box. Most people who viewed this question probably thought they were being asked how they could genetically alter water melons to grow square which would be a much more difficult process to accomplish. By looking at the question from an alternative perspective, however, the solution was quite simple. Being creative and looking at things in different ways in all portions of your live will help you find solutions to many problems where others can't see them. The square watermelon question was simply seeking a better and more convenient way to do something. The stores had flagged a problem they were having and asked if a solution was possible. It's impossible to find a better way if you are never asking the question in the first place. Always ask if there is a better way of doing the things that you do and constantly write down the things you wish you could do (but currently can't or aren't) since these are usually hints about steps you need to change. Get into the habit of asking yourself, "Is there a better way I could be doing this?" and you will find there often is. 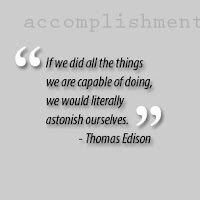 If you begin with the notion that something is impossible, then it obviously will be for you. If, on the other hand, you decide to see if something is possible or not, you will find out through trial and error. I like the way a wise man puts it. He said “Impossibilities only exists in the dictionary of fools”. Don’t you think he is right? Apply the lessons from the square watermelons to areas in your life (work, finances, relationships, etc), and with consistency you may continuously improve all aspects of your life. I should be in bed by now. I have had a very busy and eventful day – probably one of the most eventful days in the year 2012. Unfortunately’ sleep has refused to come. I have been tossing up and down my bed trying to rest, but my mind is full of thoughts and gratitude. The day didn’t really start the way I had planned it. I am in Sun City, South Africa, as a guest speaker in one of the sessions of the 34th Annual convention of the South African Production and Inventory Control Society (SAPICS). I was scheduled to speak on this day (now yesterday) and was really looking forward to it. So far, the conference had produced some great speakers from several parts of Africa, and beyond. So, to be honest, I just wanted to do my best, have fun and learn from the experience as an international speaker. Throughout the night however, I couldn’t sleep. Not because I was thinking about my presentation, but my health. I had not been feeling too well, been battling with it for some days now, and even saw a Dr before leaving Nigeria. I was given a go ahead to travel after taking some analgesic. However, on this day, the analgesic didn’t quite work for me. The state of my health was so serious that I became really worried – about my general well-being and about the fact that I wouldn’t be able to make my presentation. In my desperation, I rang up the Hotel Conceive at 3.00a.m in the morning, and they arranged for me to get to the Resort’s Clinic. The nurse on duty took my vitals and I became more worried when she asked if I was hypertensive. I had never been. That morning however, my BP was at 140/100. Anyway, I saw a Dr, who told me what was wrong (nothing serious, thank God) and gave me injections to relieve the pain for a while. The plan was to be able to deliver my presentation, after which I would go on full medication. It sounded okay to me, and I felt pretty better afterwards. As I was driven back to the hotel at about 5p.m, I kept wondering how not so well the day had started. “Would this affect my presentation in any way”, I asked myself. “Lord, please help me”, I muttered severally. After the “bad” start to the day, I got set for the rest of the day and was really in high Spirit to deliver my presentation. I ran through the slides again and felt everything was okay. I convinced myself that I had done my best, under the current circumstances. Little did I know that the day was loaded with greater surprises. I was introduced upstage at 10.50 a.m to give a presentation on Work Life Balance. The hall was almost full to capacity. As usual, my heart did a double summersault when I was given the stage but I soon found my footing and did my thing. The responses in the room were overwhelming! People were laughing, clapping, nodding, and urging me to go on. From a professional standpoint, I had perhaps the best 50 minutes presentation I had ever given. To be honest, I was pleasantly surprised myself. The way the points I raised were received was overwhelming. As soon as I finished the session, several people were milling around to have a handshake and to tell me how helpful the session had been to them. I must have shaken over a 100 hands, all from different parts of Africa and beyond. I had a follow up session (called interaction with the Guest Speaker) a couple of minutes later and the room was completely full! People were asking me all manners of questions, and somehow, I got the right inspiration to answer. I felt like a real professional (though I am not quite. I would be stupid to take any credit. I know who the “doer” is). We spent another 30 minutes in that room sharing ideas and robbing minds. After the session, I then started getting questions like “ How ‘cheap’ is it to bring you back to SA to share this topic with our management staff”; “ Are you available to share this to a greater audience”; “ Would you be back to the Conference next year”; and many more. At this point, I was really overwhelmed. For the next several hours, as I walked down the conference halls, I had to shake a hand almost every 5 mins – people stopping me to tell me how great they felt the presentation was. Infact, a couple of people I met already shared with me their actions plans for a better balance in their lives. Little did I realize that the day had just begun! The rest of the afternoon went well. I retired to my room to soak it in and to have a nap. I then strolled around Sun City with my friend and colleague Olajide Adetunji, to take in the beautiful scenery. Awesome place I would say. I wish I could meet the people who designed and built the place. I would recommend it as a vacation spot for anyone (they didn’t pay me to do this….lol). Then, I prepared for the dinner and gala night which was to start at 7.30p.m. While in the lobby taking drinks before the commencement of the dinner, I got several other handshakes and comments about my presentation. Apparently, word had gone round that a certain young man from Nigeria blew off the roof with his presentation. For like 1 hr, I keep shaking hands and talking to people about the presentation. I was planned to sit on the same table with Rueben, Clive, Collin, Susan, Barry and Jide (All but Jide are members of the Board of Directors for SAPICS). Just before the formal opening of the dinner, Collin (who was at my session) walked up to me and gave me a great handshake. He looked into my eyes and said “Temitope, I thought you did an awesome job there today. I have a feeling your presentation would win the prize for the best presentation at the Conference this year. I think you are running head to head with Professor Lumumba (who got a standing ovation after his presentation, which I happened to attend) but I think you would win it. And you deserve to”. He further explained to me how my presentation barely made it to the conference in the 1st place. According to him “We took a big gamble on your presentation and it paid off big time!” I understood him clearly. This was a supply chain conference where people were talking a lot of technical stuffs on global trends in supply chain around the world. My Paper was on something a little bit different. I was trying to show the relationship between a balanced work life, and productivity of the employees. So, it wasn’t a surprise that the paper was almost dropped. The surprise was – how come a paper /presentation that barely made it to the conference, is not being reckoned with as one of the best papers presented at the Conference? At this point, I felt really good. Honestly, I didn’t expect to win the best presentation of the conference – not in my wildest dream! I mean, this was my 1st international speaking opportunity (professionally), and I was speaking alongside very experienced people. About 50% of them were international guest speakers. So, to even be nominated for the best paper for me, was so satisfying! As soon as the dinner started, I took my mind off the presentation and the award, and focused on building relationships. My table and the tables around were filled with the captains of industries in SAPICS and international guest speakers. I try always to get the best from such opportunities, you know. Then came the greatest surprise of the day! “Ladies and gentlemen”, the diner host declared, “we have several awards to hand out tonight and we better get started”. He went on to call up stage the winners of the various awards, amidst claps and aplomb. “Now, the award for the most innovative presentation for the 34th Annual SAPICS Conference goes to ………Temitope Ogunfayo”. I honestly thought I didn’t hear right. The clap around the room was deafening! As I walked upstage to receive the award, I felt like crying. I really did. I mean, I almost didn’t make this opportunity. I got the award and took a few photographs with the presenter and was going back to my seat when I heard the host say “Temitope, I advise that you still stay on the stage as you have one more award to receive. The Paper you submitted as been adjudged as the Best Paper from a Practitioner for the 34th Annual award of the SAPICS Conference”. My God! I couldn’t believe it! At this time, many people were already on their feet applauding! I was dumbfounded to say the least. I mean, it’s my 1st conference. I felt I did a good job. But to get 2 awards in one night, amidst other international speakers? No! As I walked to the microphone to give my acceptance speech, I was lost for words. I remember a discussion my wife and I had shortly before I travelled, where she reminded me of a list I wrote, of things I wanted to do before I was 40. I finally managed to get my voice. “On my 33rd birthday, I wrote down a list of 33 things to do before I become 40. One of the things on that list was to speak at an international conference. Today, I ticked off this item on that list. Never in my wildest imagination was I expecting to get these 2 awards in 1 night. I came here to present on a topic I am passionate about. I came here to have fun. I am going back with these 2 awards. Thank you to all of you for nominating me. Thank you”. Amidst another round of applause, I went to back to my seat, and the paparazzi took over (lol). For the next half an hour, I was posing for photographs with these awards in my hand and with several people. Lots of people that met me on the way kept saying “I knew you were going to get that. That was awesome”. Within 30 mins, I had received over 5 invitations to present this paper in other places, including the APICS Conference (the American body of SAPICS)! Amazing, I would say. Now, you can understand why I have not been able to sleep. I am humbled with these awards. To state the facts, I always give my best whenever I am presented with an opportunity to speak, but today was far beyond me! I would be foolish to take the credit – very foolish. My father took the little in my hand and turned it out to something really great – something I can’t still comprehend. There is no one else that deserved the awards better than him. He is the doer! I dedicate these 2 awards to my Lord and Master, who always gives me the tongue of the learned, to speak words due in season. I dedicate it also to my lovely and amiable wife, with whom I have practiced most of the principles that I thought during the session. Consider this for a moment. You are on the soccer pitch in a capacity filled stadium. You are about to take the last shot in the finals of a game that would be determined by penalty shoot out. The hopes and aspirations of a whole nation rest on your shoulders. The game had been intense. Both teams have put in their very best for 120 minutes without a winner. Now, 80,000 fans at the stadium, and several millions watching across the globe are all focusing attention on you – some hoping you’ll score and others praying you’ll miss. You place the ball on the penalty mark, and take 3 steps backwards. The noise is the stadium is deafening and your heart beat is doing a double summersault! What a moment this can be! Whatever happens, your name will go down in the history books as the one who took the game winning shot, or as the one who caused the country to lose. It is a defining moment. Every one of us, at different point in life and career, are faced with defining moments! A lot depends on how we handle our defining moments. A lot depends on what we do at those moments, or what we didn’t do. A lot depends on our actions and inactions; our decisions, and indecisions. Our lives are a series of defining moments, strung together by passing time. Surrender fully to this moment, because it is not the moment that defines us, but how we chose to live it! I was faced with a defining moment sometime in 2006. I had just finished my Ordinary National Diploma in one of the polytechnics in Nigeria. I was privileged to finish as the best graduating student in my class, winning the Rectors’ Award for that year. Shortly after, I was interviewing with one of the best oil companies in the country and was offered a job. The salary (as of then) was intimidating to say the least. I thought to myself “this would solve my problem and my family’s forever”! In the same week, I got my admission letter for a direct entry to a University, and was faced with a big dilemma. You may not understand how big this decision was if you didn’t know my family background. I needed the bucks so much at that time and anyway to get it would have being a good way. It was a big defining moment. I was going to play a shot that would later determine a lot of things in my life and career. Looking back retrospectively, I am glad I put the shot far beyond the reach of the goalkeeper (lol). One more than one occasion, I have also faced defining moments at work – changing departments at short notice, taking up additional responsibilities, saying “NO” to some request e.t.c. Listen. Defining moments really defines us, and what happens to us, now and in the future. Be sensitive to such moments. I have discovered that life is not as difficult as some people make it look it. One song writer puts it in a way that I really like. He said “ Life is not difficult to anyone who believes that life is not difficult”. It is that simple. When you learn to play by life’s rules, you will excel and succeed in great measures. 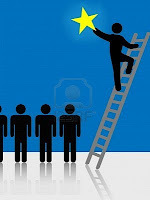 People who are excelling in life and in career have discovered certain secrets that they are exploring. They are secrets, not because they are hidden somewhere, but because you have not discovered them! When you discover what they have discovered, and practice it, you will get the kind of results that they are getting. Success is surely sold in the open market. Anyone can buy, who is willing to pay the price. Are you? It would take me several write ups to conclude a topic on hardwork and diligence. To put it simply, the only substitute to hardwork is a hardlife! The ball is in your court – work hard or live a hard life! There are too many lazy people blaming the devil for their woes! One of the greatest problems facing our nation and our continent is that we have too many people who are not working. Some may even go to work but are still not working (visit some government secretariat and you will need no further proof). We are lazy people both in the use of our hands and of our minds. This is a tragedy! Many believe that success is just being lucky. Nothing can be farther from the truth. Success comes by consistent hardwork. I like the way Alan Bond puts it. He said “I've always worked very, very hard, and the harder I worked, the luckier I got” If you believe so much in luck, it’s important to remember that hardwork increases your chances of being lucky. In the words of Vince Lombardi “I firmly believe that any man's finest hour, the greatest fulfillment of all that he holds dear, is the moment when he has worked his heart out in a good cause and lies exhausted on the field of battle-victorious” .In the school of success, there is no substitute to hardwork. Nobody becomes great without hardwork. Nobody! So, get ready to work. Everything works for him that works! Have the Right Ability to Make Decisions. Decisions determine destiny. Decisions also mars destiny. In life, our choices and decisions determine how far we go. We 1st make decisions, and then, decisions in turn make us! Where you are today is a function of the decisions you made yesterday. The decisions and choices you are making today, will determine where you will end up tomorrow. Don’t just wake up tomorrow, and be wondering how you got in there. I have discovered that success in life is not a gift. It doesn’t just fall on people like ripe pawpaw! It is a decision that you have to make. You are a direct product of your decisions. You are going to live tomorrow with the consequences of today’s decisions and choices. The choices we make today will colour the spectrum of our life in the future. It is futile to squander today and hope for a generous tomorrow. Everything that happens in your life-both what you are thrilled with and what you are challenged by-began with a decision. An average person makes about 350 decisions in a day. However, in prison, inmates are restricted to only 8 decisions daily! That is nature’s way of punishing them for the wrong decisions and choices that brought them there. Isn’t that interesting? They are not been trusted again because of wrong decisions they once made. Let me as you a direct question. Have you really decided to succeed in your life? I am not asking you if you wish to succeed, because I know what your answer to that would be. But, have you really decided to? Not taking a decision is already a decision. Not taking a decision to succeed is already a decision to fail. Not taking a decision to live a life of excellence is a decision to live a mediocre life. Not deciding to be rich, is a decision to live in poverty. Wouldn’t you rather make a conscious decision? Henry David Thoreau sums it up well when he said “I know of no more encouraging fact than the unquestionable ability of a man to elevate his life by a conscious endevour. Sir Edmund Hillary was the first man to climb Mount Everest. On May 29, 1953 he scaled the highest mountain then known to man-29,000 feet straight up. He was knighted for his efforts. He even made American Express card commercials because of it! However, until we read his book, High Adventure, we don't understand that Hillary had to grow into this success. You see, in 1952 he attempted to climb Mount Everest, but failed. A few weeks later a group in England asked him to address its members. Hillary walked on stage to a thunderous applause. The audience was recognizing an attempt at greatness, but Edmund Hillary saw himself as a failure. He moved away from the microphone and walked to the edge of the platform. He made a fist and pointed at a picture of the mountain. He said in a loud voice, "Mount Everest, you beat me the first time, but I'll beat you the next time because you've grown all you are going to grow... but I'm still growing!" A year later, he succeeded where he has failed. Again, success is sold in the open market. Let anyone go and buy, who is willing to pay the price. You will succeed! Earlier in the month, I celebrated my 9th year in the corporate world. It’s been interesting spending 9 whole years, in just one company (definitely one of the best companies to work for in the world). While I am far from where I want to be, God has helped me to make very modest achievements in the corporate world. I have been privileged to work under 8 different direct managers, from 7 different nationalities! I have also managed hundreds of people, from different nationalities, including an American. I have had great times, good times, just okay times, and a couple of bad times. All in all, it’s been a splendid 9 years. I have won several awards (the last one was just this week), including a final showing for the “Young Professional of the Year” award in Nigeria in 2008. For all these, and most especially for the people I have been privileged to mentor, coach, and touch in different ways, I am indeed very grateful to God. To a good extent, I am living my dreams. Years back, while still on campus, I had taught severally on the Secrets of accomplishments. I simply taught from God’s word, and from revelations I had from books that I had read. Then, I could only practice those principles within certain confines, but was sure they’ll work anywhere. I taught those principles as if my life depended on them. I am sure some people would have reasoned that it’s easier said than done! Over 10 years after, I can say categorically that they do work! I am a living testimony to this fact. I have handled, tried, and tested all of these principles, and they will deliver when followed. They work in the corporate world as well as they would in the spiritual work, in the market place, as an entrepreneur, and practically anywhere else. May I please share them with you, yet again? Remember the story of the rich fool? “A rich man had a fertile farm that produced fine crops. 17He said to himself, ‘What should I do? I don’t have room for all my crops.’ Then he said, ‘I know! I’ll tear down my barns and build bigger ones. Then I’ll have room enough to store all my wheat and other goods. And I’ll sit back and say to myself, “My friend, you have enough stored away for years to come. Now take it easy! Eat, drink, and be merry!”’ “But God said to him, ‘You fool! You will die this very night. Then who will get everything you worked for?’ “Yes, a person is a fool to store up earthly wealth but not have a rich relationship with God.” What a story that that nails home my point. If it must be good, then, it must be God! Ivar Kreuger, head of the company with the most widely distributed securities in the world. Even by today's standard, these were VERY rich men, and most people today would LOVE to be in their shoes..... or would they?? Let's look at how all 9 of these men, the most wealthy, powerful men the world, wound up at the end of their lives.The first man to make a million dollars a year, Charles Schwab, died in bankruptcy just twenty five years later, having lived on borrowed money for five years before his death. Samuel Insull had died penniless after spending some time as a fugitive from justice. Richard Whitney spent time in Sing-Sing prison before his death. Leon Fraizer, Jessie Livermore, and Ivar Kreuger all committed suicide because they were so unhappy with their life. Howard Hopson went insane before his death. Arthur Cutten died completely broke. Albert Fall was sentenced to prison, but was released early so he could die at home broke and alone. It is intriguing sometimes that a lot of people focus their energy on what they do not have! I really do not know why, but I have come to realize that most people do themselves a lot of harm by putting a lot of focus and energy on what they need, and not what they have. In simple terms, what you have is the key to what you need! In 2 Kings 4: 1-4, there is this story of a certain widow who came to Elisha for help. Her late husband was a prophet, but didn’t leave much to be desired for her and her sons. Infact, he left them with a huge debt, so much so that they creditors had come to pick her two sons as slaves! Just like most people, she rushed to the man of God for help! I perceive she must have been looking forward to getting something tangible from Elisha. Elisha himself spoke her mind when he asked “ What can I do to help you”? It is surprising however, that Elisha didn’t allow her to answer this question, before asking another. “What do you have at home”, he asked. Elisha realized that the key to meeting her needs was in understanding what she had. Despite the fact that the woman despised what she had at home (just a jar of oil), this was sufficient to meet her needs! What do you have? What can you do? May I challenge you to start doing that, until you find what you think you want to do? I challenge you never to underestimate what you have. Put it to use. Some time back, I discovered that I had a special skill in passing my message across with a bit of humour. You’ll be laughing while I deliver the point. I was dead broke in those days, and I needed money to pay for my school fees. I offered what I had to some evening classes around my house then, and it became a instant hit! Soon, I was teaching “humorously” in 4-5 different evening classes while the success rates were improving. I became a household name as I was different from many other teachers. You would think it was a comedy club (lol)! Up till today, I still deliver training with a high sense of humour that leaves my audience captivated. I offered what I had, and started getting what I needed….and I am still doing that till now. It is still very early in the morning. I have struggled with sleep all night. First, I stayed up till 12 midnight, trying to listen to our President address us on the state of the nation. The broadcast was billed to happen 3 hours earlier but this didn’t happen. Even after deciding to go to bed at 12, I couldn’t just get sleep! Nigeria, my dear country, was on my mind! The last few days have been very dramatic in the country. I am sure the government did not expect (or did not prepare) for the intensity of mass protests that greeted a 117% increase in the pump price of PMS. I walked for over 10 km in order to join other Nigerians in protesting against this draconian rule. I was surprised to see the caliper of the people that led and attended the rallies. A very good number of them can afford to pay 300 NGN/litre for the fuel! The issue was of course, bigger than fuel subsidy removal. It had to do with monumental corruption in government and in the nation as a whole. There is so much dishonesty at every level. It is amazing. I am in full support of the mass protests, and I sincerely hope that this would be a turning point in our nation’s history. I honestly hope that we would not just go to sleep after these protests are all over. I hope we would continue to ask our government to be accountable. Nigeria would certainly not be the same again. While meditating this morning however, it occurred to me that we do not only have dishonesty in government. We have it everywhere in the nooks and crannies of our nation. We have dishonest workers who would not put in a full day’s job. We have dishonest traders who would sell sub standard products to unsuspecting customers. We have dishonest husbands who ate unfaithful to their wives. We have dishonest parents who would do anything to make their children pass exams, including buying them the question papers. Let’s no deceive ourselves. As we ask for honesty in government, let us remember this – If we want a honest nation, then, we’ve got to have honest people. We live in a world that has become so obsessed with success and material wealth at the expense of all else. It’s very rare to see men and women of integrity who would hold on to their righteousness by all means. “The end justifies the means” is now the motto of several people, all in a bid to amass wealth. It is a tragedy! Sometime ago, a colleague sent a story to me by mail. I had read this story a few times before now, but this time around, it made more sense to me. Can I share this story with you? It is an old Ghanaian fable. “An aging king woke up one day to the realization that should he drop dead, there would be no male in the royal family to take his place. He was the last male in the royal family in a culture where only a male could succeed to the throne - and he was aging. He decided that if he could not give birth to a male, he would adopt a son who then could take his place, but he insisted that such an adopted son must be exraordinary in every sense of the word. So he launched a competition in his kingdom, open to all boys, no matter what their background. Ten boys made it to the every top. There was little to separate these boys in terms of intelligence and physical attributes and capabilities. The king said to them, "I have one last test and whoever comes top will become my adopted son and heir to my throne." Then he said, "This kingdom depends solely on agriculture. So the king must know how to cultivate plants. So here is a seed of corn for each of you. Take it home and plant and nurture it for three weeks. At the end of three weeks, we shall see who has done the best job of cultivating the seed. That person will be my heir-apparent. " The boys took their seeds and hurried home. They each got a flower pot and planted the seed as soon as they got home. There was much excitement in the kingdom as the people waited with bated breath to see who was destined to be their next king. In one home, the boy and his parents were almost heartbroken when after days of intense care, the seed failed to sprout. He did not know what had gone wrong with his. He had selected the soil carefully, he had applied the right quantity and type of fertilizer, he had been very dutiful in watering it at the right intervals, he had even prayed over it day and night and yet his seed had turned out to be unproductive. The single most important quality you can ever develop that will enhance every part of your life is the value of integrity and hoensty. Integrity is the core quality of a successful and happy life. Having integrity means being totally honest and truthful in every part of your life. By making the commitment to become a totally honest person, you will be doing more to ensure your success and happiness in life than anything else you can ever do. Most importantly, you will contribute to the progress of our country. We are in dire need of honest men.